Mambocat has launched her own pattern design company: New Blue Moon Designs. I hope to have a small commercial website available by fall 2005 for pattern sales. Patterns will not be sold on this blog. This is where the design process happens. But I can't take all the credit for my design work. Without a dedicated support staff, no knitwear designer would ever get anywhere. I'm very proud of my Quality Control department. Their high standards and round-the-clock diligence assure that only the most attractive, wearable, and softest designs make it through the design approval process. Today I'd like to highlight our Employees of the Month: "Seven" and "Shamu," both of whom are tactile assessment engineers employed in the Softness Evaluation division. Here they are in the Knitwear Testing Laboratory, scientifically evaluating the "Go Ahead, Make My Poncho," a unisex poncho done in Lion Brand Thick-n-Quick. Thanks to their hard work, I should have the pattern available for sale by the fall of 2005. Don't they deserve a pat on the back? Or at least a can of tuna? Please note that all employees of New Blue Moon Designs are provided with room, board and full benefits, including health and dental care, regular vaccinations, entertainment, and a complete retirement plan. 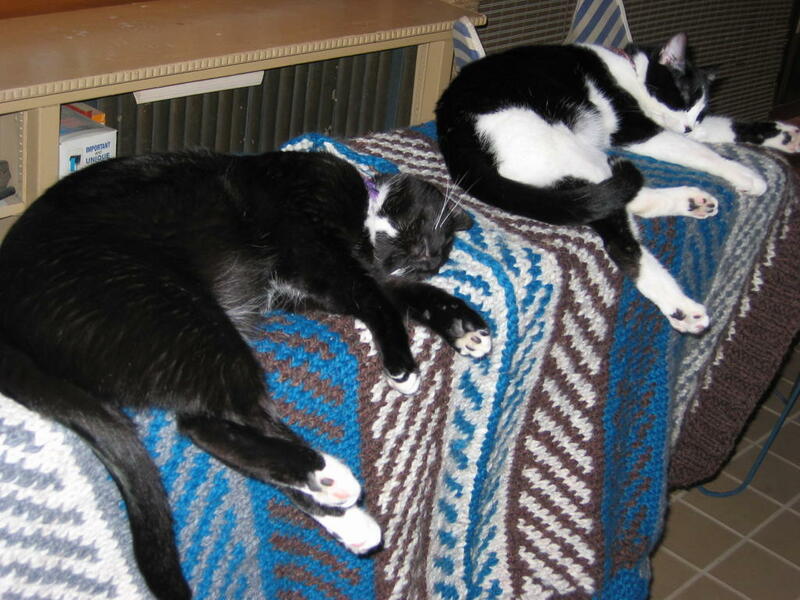 Above: Seven (left) and Shamu (right) compare bilateral tactile variations on the poncho. Ah, so I finally get to meet Shamu, after hearing so much of this beautiful feline. Oh, and the knitting looks great, too! VBG! Remember us "amples" when you design patterns that have sizes, please. So glad to see a fellow BRer posting! Have been waiting to see more posts - somehow missed the last one - and love to see the photos of the cats! now i guess i have to get a digital camera too... blogging would probably be better for it. Thank you for the beautiful blog! It was a joy to read. Your shawl is drop-dead gorgeous, your kitties utterly delightful, and your hurricane stories a hoot for me - a re-settled Westerner who is now a Southerner. Sorry to hear about your knee! Hope it soon improves, or at least that it gives you plenty of time to knit.